While Sean Payton is properly recognized for his significant contributions to the state of the modern NFL passing attack, he's often overlooked for re-imagining the role and implementation of running backs in today's NFL. There are a few reasons for this lack of notoriety: the conventional wisdom associating the Saints' offense with pass-centrism; the inconsistency with which the Saints' running game has performed under Payton; and, perhaps, the absence of a distinguishable, individual running back. Regardless of these reasons, and no matter how Payton's contributions to the running game might be perceived, it's certain that Payton has markedly influenced how franchises utilize and value running backs. In fact, Payton has been somewhat of a pioneer in his implementation of running backs over the past six seasons. When the running game has worked under Payton, it has done so with spectacular efficiency. Additionally, the Saints' league-wide ranking (by the traditional metric of yards gained) looks like this from 2006 to 2011: 19th, 28th, 28th, 6th, 28th, 6th. Here are a few more interesting stats. When the Saints log 27 or more carries under Payton, the team is a blistering 43-4 (regular and post season). When the team rushes for 125 yards or more? A perfect 31-0. It seems fairly obvious that there's a significant correlation between the efficacy of the Saints' rushing attack and the team's overall success under Payton. And while the reasoning behind this optimal level of performance is certainly more complex than just the effectiveness of the ground game, it's plain to see that when the Saints run the ball well, the team is virtually unbeatable because their offense is, literally, unstoppable. The obvious problem is that the running backs, and the rushing attack by extension, haven't been reliable every year. This inconsistency in the Saints' running game, year-over-year, is likely attributable to several factors, notably among them injuries ('10), lack of depth or overall talent ('07, '08), playing from behind ('07, '08), and perhaps an inconsistent application of the rushing attack in the overall offensive scheme. And though Payton hasn't consistently executed it optimally, he's remained committed to getting it right. His usage of running backs in both the ground and air games has remained a work in progress, one that in the last three seasons has increasingly seen ineffectiveness and inconsistency give way to efficiency. But what happens this year without him? During the 2009 season, Payton was perhaps the first coach (?) to fully implement a three-back system that segmented roles into specialization, thus limiting injuries; mitigating reliance on the production of one player; diversifying the offense as whole; and confounding opposing defenses with a myriad of additional formations. Aside from the fact that this approach expanded the offense, it produced a highly-effective ground game for the first time in Payton's four seasons as coach. After a noticeable lapse in 2010, Payton fine-tuned his approach in 2011 by adding a fourth running back to the rotation and, more importantly, landing Darren Sproles. Implementing Sproles into the Saints' offense brought to life--drastically and immediately--the dimensions that Reggie Bush tantalized the team with, but failed to consistently deliver, for years. As a result of Sproles' devastating impact as both a runner and a receiver (scroll down a bit if you click the link), popular sentiment across the NFL has identified Sproles as the paradigm of modern NFL running backs. That's right. A 5'6" running back in Sean Payton's pass-happy offense suddenly labeled as a "state of the art" running back. Thanks (again), AJ Smith. Who knew, right? This familiar Smart Football article gives us a better understanding of Sproles' impact, and explains the running back's criticality in an advanced, diverse NFL offense. Through Payton's standardization of the three/four-back system, coupled with his progressive application of running backs in the passing game, it seems probable that teams league-wide have started to re-examine their running backs' roles as a direct result of these advancements. And though this progression might not be popularly attributed to Payton, its impact and relevance is undeniable and Payton's innovations in this area merit praise. 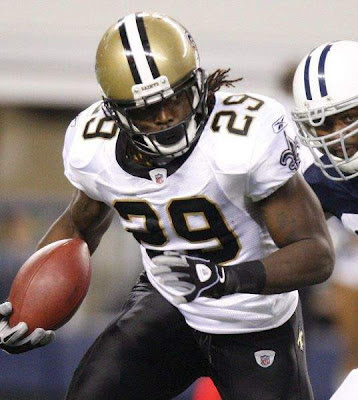 Absent Payton in 2012, it will be interesting to monitor the performance of the Saints' running backs under Pete Carmichael, Jr. Because the running game has been so closely tied to the team's ceiling, it will be noteworthy to see how Carmichael utilizes his running backs this year. What stays the same, what gets phased out, and what gets added? 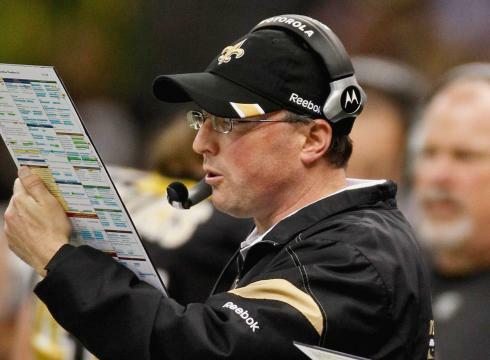 Further, while there are certainly Payton-devised adjustments already in place for 2012, it will be Carmichael's job to refine and add adjustments as the season progresses. This should be fun to watch. Will the loss of Carl Nicks significantly impact the offensive line? Will Ben Grubbs fill in seamlessly? Will the rushing game be as dominant as it was in 2011? How will Mark Ingram perform in his second season? Can he stay healthy? Where does Chris Ivory fit in this year? Can Sproles continue to be a dynamic force at age 29? Can Pierre Thomas maintain the high-value form that's made him an indispensable component and merited him elite status by practitioners of advanced metrics year after year? If the recent past is any indicator, the success (and health) of the Saints' running backs will go a long way in determining just how good this team will be. Without Payton in the mix, predicting an outcome is an impossibility. It's now in the hands of the inconspicuous PCj, who just might be ready to impress upon the Saints' running backs his own brand of unsuspecting dynamism. Running back by committee has now been redefined. arguably the best stable of running backs in the league. I think that winning games causes more rushing yards and not the reverse. Stats are very misleading when trying to show causality. Did we win because we rushed more or did we rush more because we won? You can't really tell just from accumulating the stats and looking at them in the way that you have. Great read nonetheless. it would interesting to know during the 31 - 0 games when the team rushed for 125 or more yards, how often the Saints trailed in these games. I believe that the game plan and its execution play critical roles in the games' outcomes. Great topic Reid. In those 31 games, the Saints trailed at half only three times: vs. PHI '06 playoff; vs. DET '11 playoff; @ MIA '09. Also, the Saints only trailed after the 3rd quarter in two of those 31 games: vs. ATL 12/08; @ MIA '09. If I have some time later, I'll figure out what percentage of total rush yards came in the 1st and 2nd halves of those 31 games. But yes, it appears that the Saints run the ball exceptionally well when they're playing with the lead. It's a closer balance than I thought it would be. In ten of those 31 games, the Saints accrued 60%+ of their rushing yardage in the 2nd half. Conversely, in five of those 31 games, the Saints accrued 60%+ of their rushing yardage in the 1st half. I think this will be the question of the year for the Saints. I have a lot of confidence though because of how long both PCJr and Drew have been in Payton's system. I think that Carmichael and Brees working together can probably make up for the loss of Sean at least 85 to 90%. The in game decisions will be the key for the 1st 6 games with Vitt out. But let's face it guys, Carmichael called the plays from the Tampa game that Payton got hurt on and the Saints were the best offense in league history and they won their last 8 games...That to me speaks for itself. I think Pete and Drew are extremely confident.